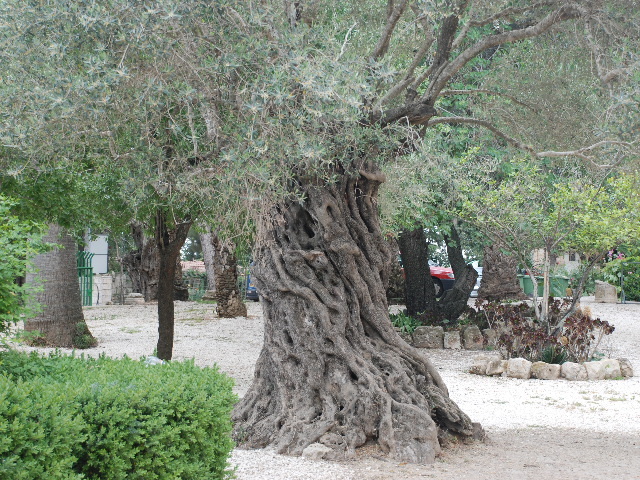 I love this ancient olive tree on the grounds of the convent here on the hill of Kiriath Jearim. It reminds me of the ancient history of this place, where the Ark of the Covenant was kept for many years. I felt honored to stay here and entered into the blessing and glory of this place. It was a privilege to meet the precious sisters who have been entrusted with the guardianship of the history and happenings of this sacred spot. They have been so warm and hospitable and serving. I have seen the Lord in their service and smiles. Their consescration and devotion has deeply touched me. My good-bye is bittersweet today. There is so much peace here that I am a little sad to leave… and I certainly hope we can return to this spot for more respite and writing. This afternoon we return to the states. I will be back in my own bed Saturday night. And that will be sweet too. Thank you so much for sharing. We pray that you have returned safely. I’ve been to this garden. The olive trees blew me away, how they seemed to be growing layers upon ancient layers. We have Russian olives at our place, and they are somewhat similar — not remotely as old — in that the older ones can look very gnarly.